Baron Keyes, a popular staff announcer at Los Angeles radio station KPLA, created the fun old time radio childrens program Air Castle. 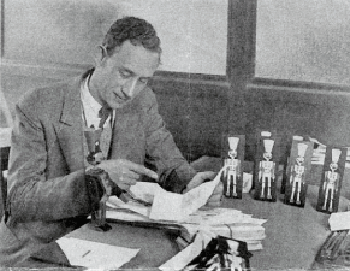 The popular children's show debuted on station KHJ on February 13, 1928, two days after leaving KPLA. The show, originally targeted to preschool aged children, featured a large cast of characters. Keyes wrote the dialog, wrote and performed the songs, and voiced all of the characters. Characters included Clickety-Clack the wooden man, Yip the wooden dog, Wooly the puppy, Happy Duck, Bugler Murphy, President Pip and many more. Many of the characters did not speak actual words but made noises that Story Man or President Pip interpreted for the children. For example, Clickety-Clack made tapping sounds, Bugler Murphy's voice sounded like a tooting horn. After some dialog with the characters, the Story Man told a short story. At the end of the show, Story Man goes back to the real world anticipating his return the next day. The show originally targeted pre-schoolers and was on from 9:30 - 10:00 a.m. and was very popular. In May, the show was moved to 5:00 p.m. to reach a larger audience of children. The show was so popular that fans started asking to see the characters. 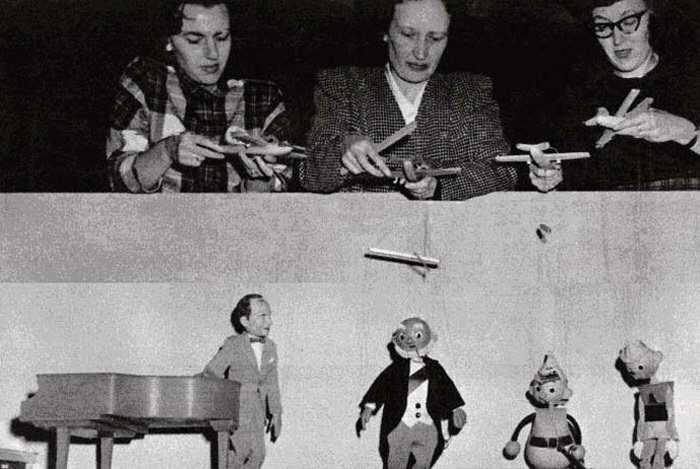 Eventually, the most popular characters were turned into marionettes. 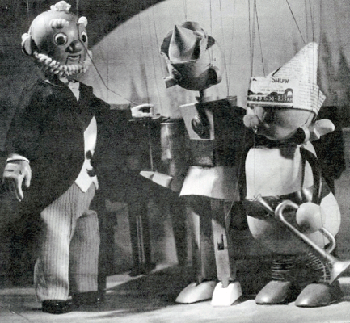 Eventually, Keyes and his cast of marionette characters were performing three shows every Saturday at the Beaux Arts Theater in Los Angeles. Air Castle is a West Coast regional show. It was produced in Los Angeles and broadcast in Los Angeles and San Francisco before NBC syndicated the show to nine stations in the western market. The show format started at 30 minutes, went to an hour and back down to 30 minutes then to 15 minutes. It also changed stations from the Don Lee network to the first version of the ABC network before going back to Don Lee. For more charming children's adventure serials see also: Big John & Sparky, Cinnamon Bear, Magic Island, and Little Orphan Annie. Hi Jon, Wow!! The order already arrived today. That was fast! I know my son-in-law will enjoy them! Thank you for the fast service!